Amy Silverberg (@AmySilverberg) joins the ladies to discuss the awkwardness of doing stand-up for family members, the tricks her students try to play, and flat-earthers. The ladies also share tips on how to get out of tickets, longterm relationship secrets, and the red pill convention. They answer a lady problem from a listener who’s friends stopped inviting her to group hangs and never make an effort. There’s only about a week left to participate in our charity drive! Donate to Wings of Rescue and receive a hilarious Death Becomes Her commentary track with the ladies and Karen Kilgariff! Donate $10 or more to WingsofRescue.org & email your receipt to MyFavoriteMurderLady@gmail.com for access and to help save furry little animals. Get furniture that brings you joy by going to www.JoyBird.com/LADY for 25% off your first order. Start investing in the stock market with Robinhood today by going to www.LadyToLady.Robinhood.com and get a free stock to get you started. Start your own website today with Squarespace! Use the code “LADY” at www.Squarespace.com to get 10% off of your first website or domain. Writing: She’s currently a Doctoral fellow in Fiction at the University of Southern California, where she teaches. Her writing has appeared in various magazines, and will be anthologized in Best American Short Stories 2018 edited by Roxane Gay. She’s currently at work on a collection of short stories and a novel. In addition to fiction, she writes jokes, humor, book reviews, essays, sketches, and scripts—some of which can be found on this site. What doesn’t Amy write? Romance. Comedy: Amy was a New Face at Just For Laughs in 2018. 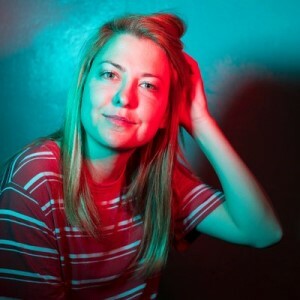 She co-hosts two monthly stand-up shows: Bitchface Comedy in Pasadena and Wolf Den in Silverlake. She has a set at Comedy Dynamic’s Coming to the Stage available on Pluto TV. She also has a set on Inside Joke with Asif Ali coming out on Amazon Prime. Most importantly, she was once a contestant on Wheel of Fortune, during which she correctly guessed the phrase “He’s Just Not That Into You” but still didn’t win. She likes animals doing human activities.